Good gravy. That wasn’t a bad loss in the “oh man that’s a gut punch” sense. That was a bad loss in the “how do you get blown out at home by a team that’s not even pretending to be competitive?? ?” sense. 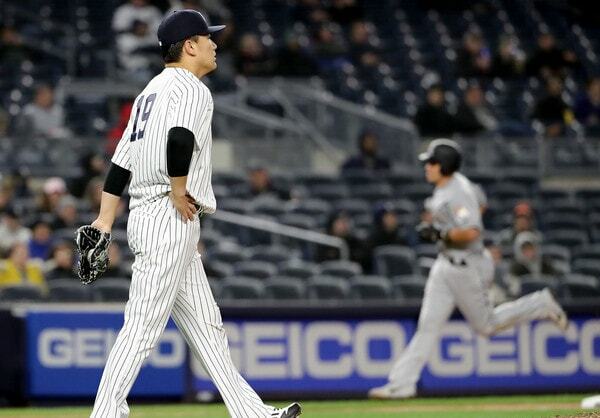 The Yankees lost Tuesday night’s game 9-1 to the not even trying Marlins. What a miserable game. I was running around a bit and I only caught part of the game on television and part of the game on radio, so I can’t talk about it too intelligently. (Not that I usually do that anyway!) So, rather than a full recap, here are some points on one of the uglier losses of the season. This was bad. Tyler Austin had two catchable balls clank off his glove — they were the kinda plays a big league first baseman should make — but was only charged with one error. (To be fair, he also made a real nice diving stop along the foul line as well.) Neil Walker and Miguel Andujar couldn’t reel in potential ground outs. I’m willing to overlook Didi’s error. He’s awesome and sound defensively. Everyone else? Nope. Errors can be dumb and they are not the best way to evaluate defense. The Yankees’ error total does, in my opinion, accurately reflect how shaky they’ve looked in the field so far this season. Routine plays are not being converted into outs and they’re paying the price. They’re paying the price in runs and extra pitches. The defense has to be tightened up. They’re better than this.
? Love Miggy. He doubled earlier in the game — Jarlin Garcia took a no-hitter into the fifth, annoyingly — and now has six extra-base hits in his last three games (triple, homer, four doubles). Andujar is the first Yankee with multiple extra-base hits in three straight games since Carlos Beltran in 2015. Glad he’s getting more comfortable at the plate. With Brandon Drury out indefinitely, Andujar should play every single day, no questions asked. 3. Blown opportunities. I have no problem tipping my cap to the opposing pitcher when the situation calls for it. Sometimes a dude has a good game and you get shut down. It happens. Jarlin The Marlins did not pitch particularly well in this game. Five walks in five innings? Plus a bunch of hitter friendly 2-0 and 3-1 counts? Nah. The Yankees let Garcia off the hook more than Garcia earned his five shutout innings. I’m not tipping my cap this time. Back-to-back walks in the first? Giancarlo Stanton hits into a double play and Gregorius grounds out. Back-to-back walks in the third? Stanton pops up a 3-1 pitch and Gregorius grounds out on a half-swing. A walk, a single, and another walk to load the bases in the sixth? Walker and Austin struck out. The Yankees went 0-for-10 with runners in scoring position. Stanton heard all the boos because booing him is the cool thing to do now, but the entire offense stunk. 4. Leftovers. Judge’s hitting streak came to an end at 12 games. Oh well. He did walk twice though. His on-base streak is up to 13 games … Masahiro Tanaka’s defense did him no favors in the three-run first inning, but the J.T. Realmuto three-run homer to put the game out of reach is all on him. He’s allowed at least one dinger in every start this season, including Spring Training … Luis Cessa, who was called up to replace the injured Tommy Kahnle, got hurt. So it goes. Here are the box score, video highlights, updated standings, and Bullpen Workload page. I’m not going to bother to embed the win probability graph. It’s lopsided. Duh. The Yankees have yet another off-day Wednesday — a scheduled one this time — then they’ll open a four-game series with the Blue Jays on Thursday. CC Sabathia and Aaron Sanchez are the scheduled starters for the opener.